Windows Vista setup installer for 32-bit and 64-bit edition downloaded from msft-dnl.digitalrivercontent.net via HTTP direct download links is in .WIM Windows Imaging Format archive package. Fresh clean installation of Windows Vista, upgrading from Windows XP or converting from 32-bit to 64-bit Windows Vista can be run by executing X13-49120.exe or X13-49121.exe executable. To burn the .WIM image to a DVD is a more complicated but not impossible task. A how-to guide explains the steps to convert and make or create create a bootable DVD from the downloaded .WIM Windows Vista image files. 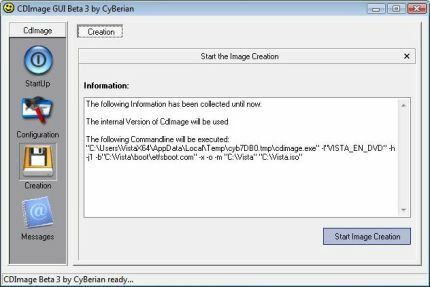 This article will demonstrate illustratively with screen capture images and graphics on how to perform the steps, and also make sure of CDImageGUI.exe graphical user interface (GUI) front-end for CDImage.exe program. The example uses 32-bit Windows Vista, and assumes that all operation is done on root directory (C:\ drive). After downloading the setup installer for x86 edition of Windows Vista, there will be three files downloaded. Execute and run the X13-49120.exe file, a “Windows Vista Setup Preparation” dialog will appear to extract the setup files. After the files are fully and completely extracted, Install Windows Vista setup window will automatically launch. Do not continue the installation. Instead, click on the Close button on the top right corner to exit the installer. In the folder or directory where the three downloaded files are located, a new folder called Vista will be seen. A check will show that the contents of the “Vista” folder is 2.52 GB in size, the typical size of the DVD image for 32bit retail edition Windows Vista. 64-bit size will be larger. 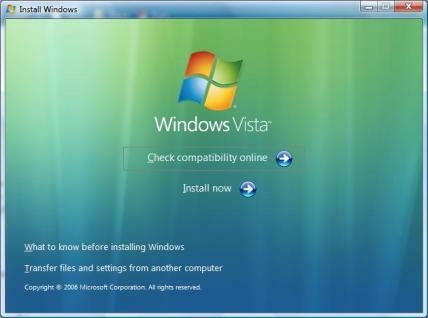 Inside the “Vista” folder, the following data and contents can be found, which is the full version of Windows Vista Retail. Downoad CDImage GUI front-end application CDIMAGE_GUI.EXE. WinRAR self-extracting archive dialog box will appear. Click on Install to extract the files to C:\ root drive. A new folder called “CDImage” is created with 3 files – cdimagegui.exe, cdimagegui.ini and boot.img. 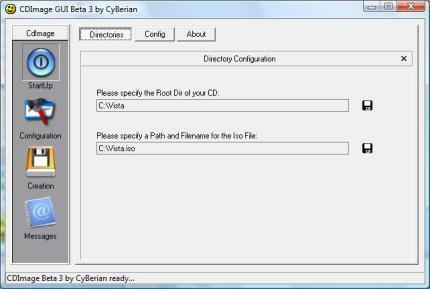 In the “CDImage GUI Beta 3” window, type or select C:\Vista as Root Dir of the DVD, which is also the source directory to put on CD/DVD, and C:\Vista.iso as the path and filename for the output ISO file. cdimagegui.exe will load the default setting from cdimagegui.ini, so you should have all these settings set. If your folder is the same, no change is needed. Only change when the path in your system may be different. Click on Configuration icon on the left pane. Then click on Boot tab. 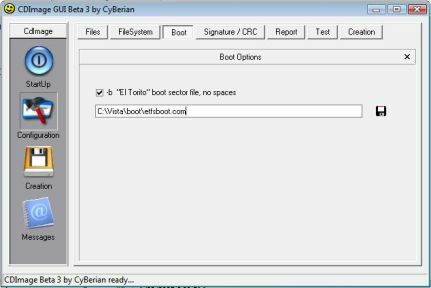 Type or select C:\Vista\boot\etfsboot.com as the boot sector file. Again, the setting should be set by default, unless your path is different, no change is need. If you want to change the volume label for the DVD, go to Creation tab under “Configuration”. Click Creation button on the left pane. Start creating .ISO bootable DVD image for the Windows Vista setup files by clicking on Start Image Creation. Once the .ISO image file is been finished created, open your favorite CD/DVD burning software such as Nero or Roxio to burn the image or ISO to DVD.